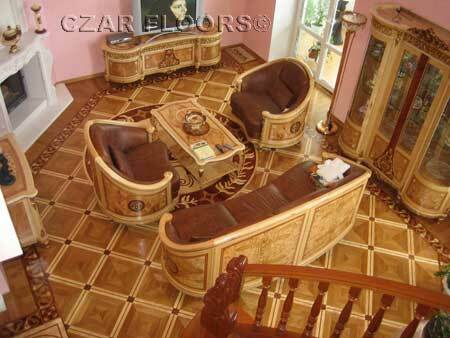 Welcome To Czar Floors. We design, craft and supply unique Wood and Natural Stone Floor Medallions, Borders, Custom Inlays and Parquet Flooring. Buy Direct from the industry leader, made in U.S.A. custom floors. Shipped to your doors or anywhere else. 2007 Floor of the Year Winner, NWFA Best Commercial installation -"Mother of all medallions". 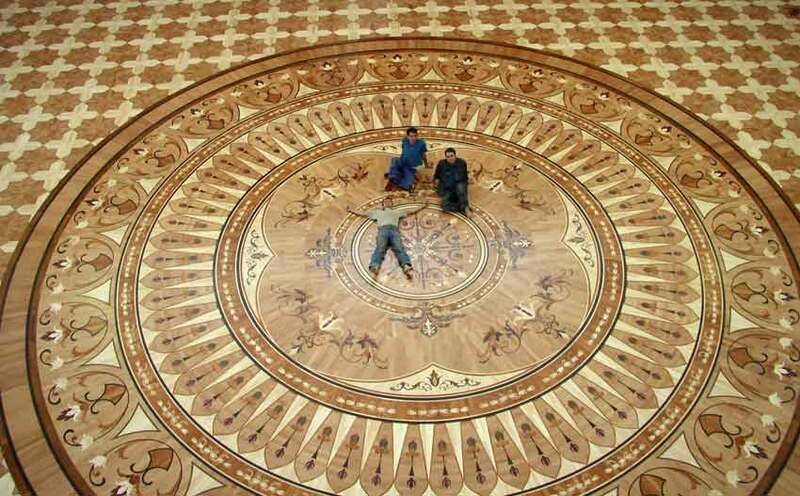 Massive, 45 foot wood floor inlay comprised of hundreds of intricate parts. 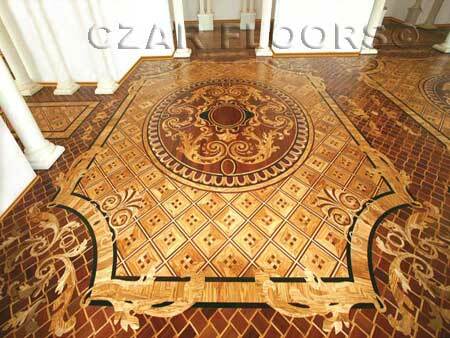 Czar Floors is a leading designer and producer of hardwood floor medallions, floor borders, custom floor inlay, natural stone medallions and parquet flooring. We are the experts in decorative hardwood flooring for the residential and commercial designer floors. 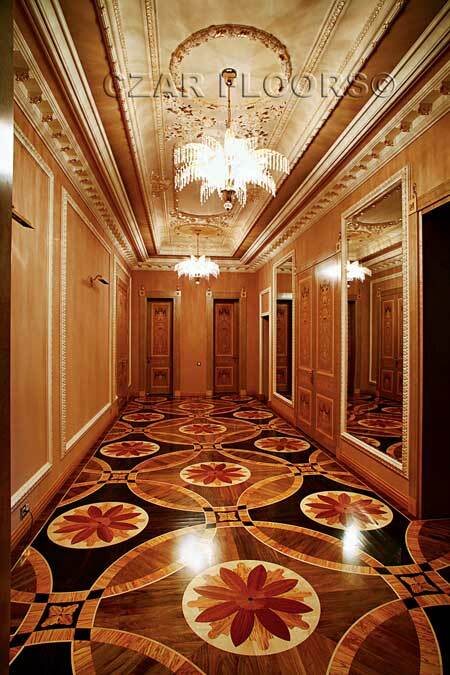 Czar Floors works with architects, designers and decorators on the most prestigious projects around the world. 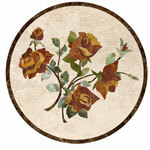 Czar Floors today has the largest collection of decorative floor products on the market. Hundreds of hardwood flooring medallions in a variety of sizes, styles and options, made with exotic or domestic hardwood, natural stone, marble and granite. Numerous inlay floor borders styles. Vast selection of parquet and herringbone patterns. 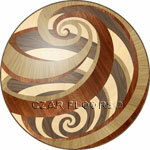 Czar Floors has become a one-stop shop for professionals and homeowners looking for distinctive wood floors. Our exclusive semi-custom artwork offers many options to personalize any piece to your unique taste. On this website, you will find a fine selection of wood floor medallions, stone medallions, beautiful floor borders , striking decorative Parquet floors, Herringbone. You may start your tour with our photo Gallery. See how the most beautiful floors are created by using different design elements. 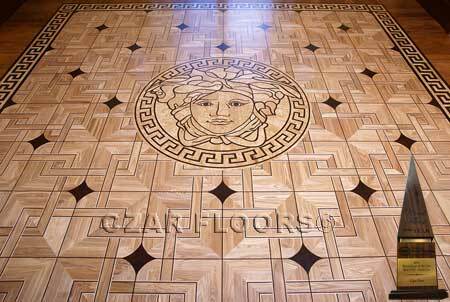 Combining wood floor medallions, stone inlays with borders and parquet makes a dramatic effect. Get new ideas and let us design your unique and beautiful hardwood floor. 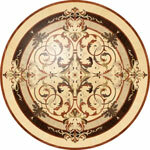 Popular wood medallion designs recreated in natural stone, marble and granite. 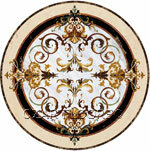 Tile medallions can be used indoors or outside, as a kitchen backsplash or tabletop. 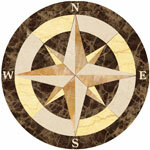 Waterjet marble medallions are easy to install and fit with marble or porcelain floors. Requires modern browser such as IE9+, Chrome, Firefox, Safari. 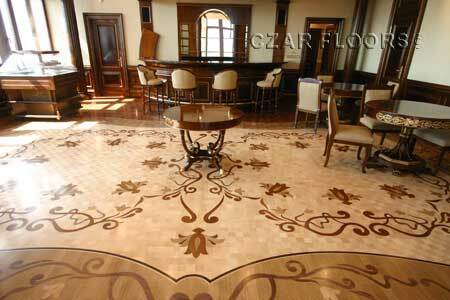 Czar Floors developed online custom floor design application. This application allows you to build a complete floor plan using any of our design elements, including medallions, borders and parquet. After building your floor plan, you can estimate your project cost and share it through email, all from within your browser-no extra software required. We will be adding more design elements, floor models and features in the future. Czar Floors have been selected by the Houzz community as a winner of 2013 and 2014 "Best of Houzz" awards in Customer Satisfaction category! 2016 NWFA Floor of the Year Award. Czar Floors was awarded The Best Floor of The Year of 2016 in Best Extreme Makeover category. Czar Floors hand-cut these koi inlays into an existing floor in a sunroom overlooking a real koi pond outside the home. 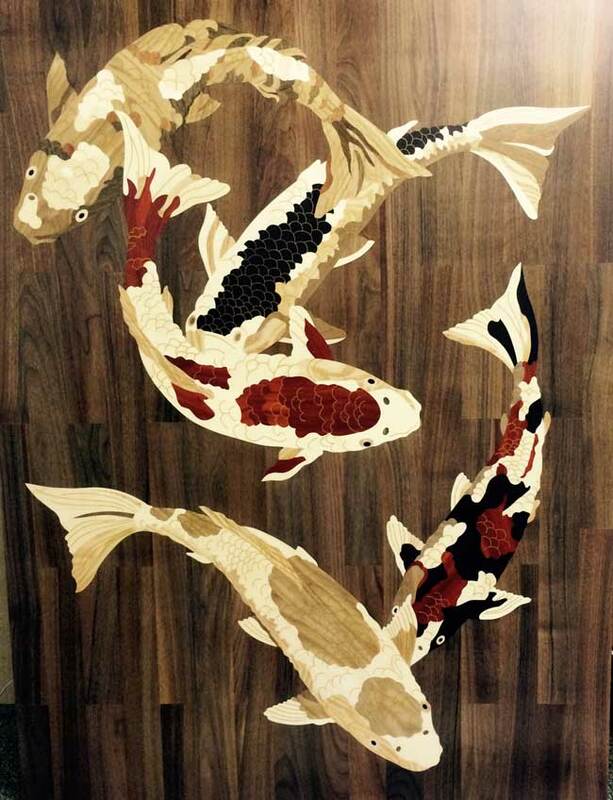 The colors of the koi were achieved using different species of wood, including maple, wenge, white oak, bloodwood and walnut. 2013 NWFA Floor of the Year Award. Czar Floors was awarded The Best Floor of The Year of 2013 in limited wood species category, our 7th award. 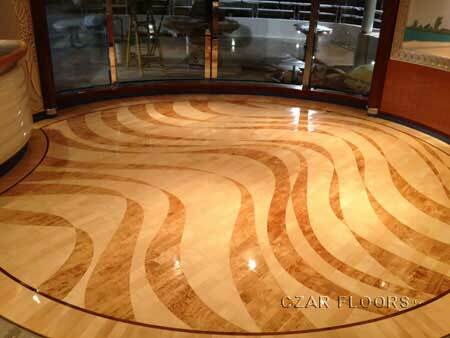 For the 187-foot super yacht "Lady Linda Czar Floors created a unique custom floor using Karelian Birch and Maple. 2012 NWFA Floor of the Year Award. Czar Floors was once again awarded The Best Floor of The Year of 2012 in restoration category. 2010 NWFA Floor of the Year Award. 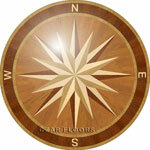 On March 25th, 2010 in Washington DC, Czar Floors was awarded The Best Floor of The Year in CNC/Laser Cut category. 2008 NWFA Floor of the Year Award. This parquet flooring and wood border design had to be scaled to fit the specific shape of the room and it's dimensions. The woods were selected to complement the beautiful veneers on the furniture. You may order Border and Parquet used in the project. 2007 Floor of the Year Award. Ten different woods used in this intricate inlay flooring. The intricate hardwood flooring inlay was prefabricated in precisely pre-cut modules and fit on-site in perfect composition. Wood Floor Medallion RZ260 used in this award winning hardwood floor became one of the most popular inlay models among other wood floor medallions. The same design flooring was replicated in several high-profile floor installations. This type of intricate floor is usually scaled for a specific room with all elements being precut and fit at the factory. Marked modules are put together on-site to form the design. It minimizes errors and effort during installation phase. 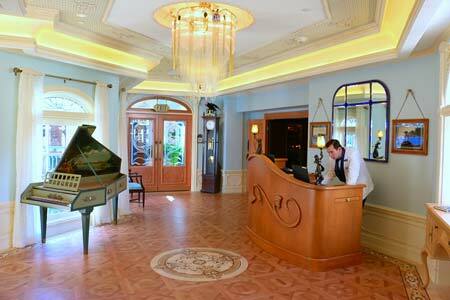 Disneyland's secretive Club 33 received a massive makeover and was unveiled on July 18 2014. Since its debut in 1967, Club 33 has maintained its status as the most exclusive area of Disneyland, a restaurant open only to its members and their guests. Czar Floors crafted the floors for this incredible establishment. Wood Floor Medallion Magic used in the hardwood floor along with Bordeaux parquet made in European Pear wood. 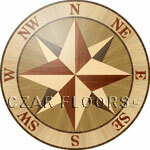 Selection of smaller, 24" or less wood floor medallions!. Smaller hardwood medallions can be used as floor accents or floor inserts on stair landings, decorative inlay corners for wood floor borders. 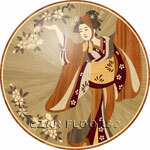 "Japan" medallion received the Platinum ADEX Award. 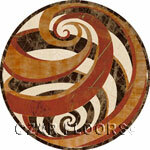 The Gold Award went to the new "Vortex" marble medallion. Award for Design Excellence(ADEX) is awarded yearly by Design Journal magazine.